A bigger boat would offer a more stable platform and more living space but our criteria would be hard to meet; it would have to have all of Caramor’s strength, sea worthiness, good design, space for toys and in addition, full forward visibility from the navigation desk so that we could do watches from inside in high latitudes and a bed with headroom that wouldn’t involve a scramble to get into. The cost of maintaining such a boat would simply be out of our league, the rule of thumb is that for an extra four feet in length, you double the volume, you also double the cost. In Spain we bought a block (small pulley) a size bigger than Caramor’s standard and it was twice the price! Berthing fees would go up, antifouling would take much longer. Not least, we would have to sell Caramor. The truth is I don’t think we could steal ourselves to do that. She’s looked after us all these miles, all these years, she’s an old friend. You don’t sell your mate! The next morning, we opened up the bilge to dig out a water container and were shocked to find a punctured carton of red wine. Caramor had poured the contents down her bilge and discarded the carton to one side. Not surprising the night had been a rocky affair. Franco admonished her, he runs a dry boat at sea. 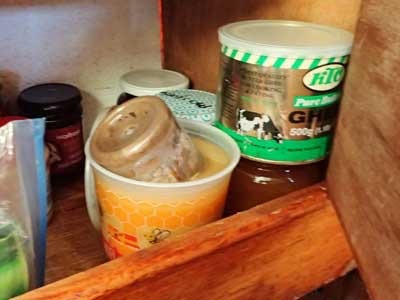 Jar of tahini firmly implanted into the now lidless honey pot - can you imagine the sticky mess? Just the kind of silly thing one would do to get even! Never ever speak about buying another boat within earshot of your best beloved, not even in jest!